Why not try the Mystic Wolf Video Slot? 50-line, 5 reel video slot. Follow the Wolf on a quest for treasure with Mystic Wolf, Rival's latest 5 reel slot. Watch the Wolf as he's howling at the moon and running through the forest. playing card values &#8211; 9, 10, Jack, Queen, King, and Ace. I can't wait to try the new slot when it gets here in the am!!! I only received 10.00. I signed up threw the desert nights banner? This is one of the Rivals we here at Streak Gaming highly support! $20 no-deposit bonus for new players is a great offer! Yes I’ll want to give the Mystic Wolf Video Slot a try. This 50-line, 5 reel slots sounds interesting. 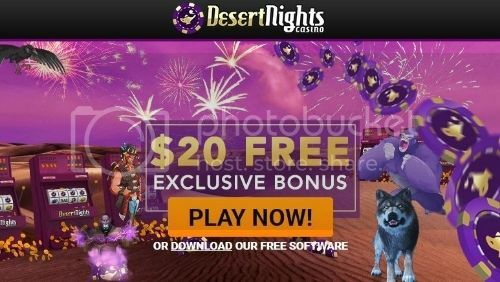 Whoa, I can’t believe this is a free, no-deposit bonus from a big gaming platform like Desert Nights Rival Casino! A $20 free bonus for beginners is not bad! I am sure lots of people will want to make the most of this opportunity of trying the Mystic Wolf Video slot. Good luck all those who are ready to give it a go! Rival brands have become a big fav of mine!! $20 bonus for new comers is surely a good boast. But most of the time these are just promotional gimmicks. Hope this is not one, I am registering. Desert Nights Casino has a whole new look!! If you do not already have an account, this offer is still valid! !